Whether you are a professional gardener or you consider gardening a personal hobby, owning a garden cart would greatly benefit you and make every job in the garden easier. There are different types of garden carts that can be used in a variety of ways, and we will hereafter try to explain all the important features of each type. If you want to find the best garden cart that the market currently offers, and be certain that it will answer all your needs adequately, you’re at the right place. Besides guiding you on how to pick the best one, we review the five currently popular carts on the market. 2 Why Buy a Garden Cart? 3 What can you use the garden cart for? 4 What type of the garden cart best suits your needs? Gorilla Carts Steel Garden Cart features a steel bed which accounts for almost 37 lbs. of the weight of this cart. The size is approximately 40.6 x 18.3 x 37 inches, but when you remove the sides, it turns into a flatbed and can be used to transport quite larger loads. Removing the sides is fairly easy. It is even easier to clean them, and they are very sturdy. It took us about half an hour to properly assemble it, and we had to use tools such as a screwdriver, needle nose pliers, and adjustable wrenches. The thing we have noticed is the strong rubber odor, but it faded away after the few days. The wheels are pneumatic and broad enough to go over uneven terrain smoothly. Be careful though not to pierce them. Gorilla cart is easy to pull even with 200 lbs., Hauled in it, and it is advertised as being able to transport an incredible 400 pounds. On the downside, their center of gravity is high, and they tend to tip over. However, if you distribute the load evenly, you can avoid such a situation. Suncast GDS200D Garden Scooter is very light as it weighs only about 9 pounds. The overall dimensions are 12.25 x 22.5x 13in., and it provides 8.5 gallons of storage space. It is ideal for older adults as it doubles as a comfortable gardening seat and includes an accessories bin for gathering produce or organizing supplies. The inside is bigger than it appears and holds quite a lot and you receive a smaller carrier with the handle inside as well. The pulling strap is long enough and allows for you to pull it anywhere you need very easily. The lid shuts down securely so even if you forget the cart out in the bad weather everything inside stays dry. As a plus, there are two drink holders although quite shallow. The cushion on the top is quite comfortable to sit on and can also serve as a kneeling pad. The scooter carries a grown man without any issues, so the plastic seems quite sturdy and reliable. The wheels go over different terrains with no problems. This scooter is a perfect, budget-friendly, option for those who do the gardening around their homes. However, it is not a good choice if you need to tend to large surfaces and carry heavy loads. The Polar Trailer 9393 LG7 cart comes in a big box and needs to be assembled with a few ordinary tools; it takes approximately 30 minutes to finish. The dimensions of the garden cart are 65″ X 31″ X 28″, and it can hold up to 6oo lbs. of the load. The two best features are that it can dump load and be used as a dumping trailer with an ATV or a lawn tractor. The release latch for the dump bed is well constructed and should hold up quite well. The dump bed is made of plastic (polyethylene). However, it seems stable enough and durable. The handy hitch bar can swivel to either side when the bed is released for dumping. The wheels are not the pride of this unit, as they appear more plastic than rubber; however, after hauling some heavy rocks on a quite rocky terrain, we have realized that they can withstand a lot. We recommend these garden cart to those who need to transport heavy and bulky items often, as they are heavy duty and can handle a massive load. 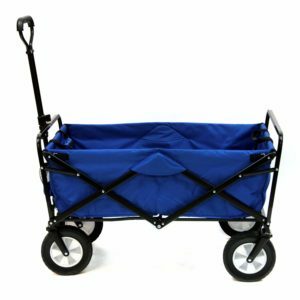 Mac Sports Outdoor Utility Wagon is available in seven different colors; it is made of waterproof Durable 600D Fabric which we have been able to clean easily by simply hosing it down after each use. When the cart is opened its size is 35.5″ x 20″ x 22.5″, and when folded 9.5″ x 20″ x 8″, but they are rather heavy and weigh almost 30 pounds. It is very versatile and can handle various outdoor and indoor jobs effortlessly. The advertised capacity is up to 150 lbs., we have tested it with 100 lbs., and they managed the weight with no problems. Moreover, the cart folds very easily by pulling the string in the center of the wagon. It is very compact and comes with its storage case. The handle extends about 16″ past the wagon which might not be enough for comfortable use if you are taller, and can either lock (upright) or release (pull-type). You can also lock the length of the extension. The wheels work fine on different types of terrain; they are not locked to the handle in the front. This way, you can turn the wheels without having to turn the handle which is excellent for tight spaces, but it tends to move around a lot when pulling a heavy load. The greatest problem is that the cart does not have breaks, and you cannot lock wheels in place. For this reason, be extra careful if you set it on a hill as it will speed down. Suncast LC1250D Poly Rolling Garden Cart is another budget-friendly option for in-home users. 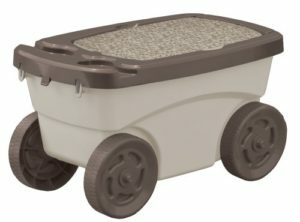 It is made of durable plastic and weighs around 11 lbs., with the storage space of approximately 15.5 gallons. It features large wheels (7-inches) and metallic axles which allow it to operate on all terrain types smoothly. Since it is a two-wheeler, it is very easy to maneuver in small spaces. Another plus is a comfortable telescoping handle that has been long enough for us to pull the cart comfortably. As it is made of plastic and very light, it has been rather easy for as to lift it up and dump the content. A recess at the bottom is added for a secure grasp when lifting it. The bucket-like design allows for you to insert a garbage bag inside and secure it around edges, in this way you avoid the cleaning. On the downside, the cart tends to tip backward on a slanted surface when empty; it can be resolved if you put something at the bottom of the cart. Another issue that might bother some people is that they are quite loud when riding. Also, it is too shallow to carry rakes and shovels around, yet, anything you wish to put into it has to be lifted up which requires strength and can cause back strain. Why Buy a Garden Cart? Many modern carts have cup holders to hold your beverages too, wouldn’t you like that? What can you use the garden cart for? What type of the garden cart best suits your needs? In order to answer this question, you must get acquainted with all the types that are currently available on the market. Some types are better for some gardening tasks and some for others. No one but you can know and decide what type best fits your needs, so be sure to read the following descriptions and decide for yourself. The distinctive feature that separates this type of garden cart from others is, as the name suggests, its ability to dump. It is especially useful for the older adults and the ladies as it prevents back strain. It can look similar to a utility wagon or a wheelbarrow and have a four-wheel or a two-wheel design. 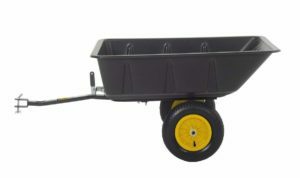 Dump carts can be used for hauling soil, grass, garden clippings, fertilizer, wood and even rocks- and there is no need to lift them in order to get the heavy load out- sounds perfect, doesn’t it? 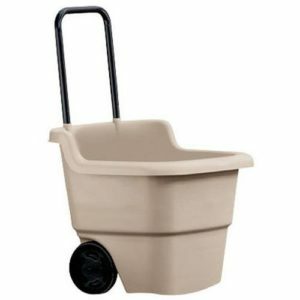 Once again, as the name suggests, this type of cart resembles a wagon and typically has four metal sides that can be opened or removed to access the load quickly and clean the cart after use. They are perfect for all kind of loads since the removable sides allow for even the bulky or massive load to be transported. For this reason, they are often used to carry beach accessories or groceries too. The most important feature to pay attention to when purchasing this type of cart is the length of the handle you use to pull the wagon. It is often too short for comfortable use, especially if you’re higher than average. This type of garden cart is distinguished by the foldable sides usually made out of waterproof and durable fabric, which is easy to clean and dries quickly. They are particularly useful for people who have little space available to store their garden cart as they take up very little space when folded. They are also very versatile as they can be folded and loaded into the car to be taken wherever someone needs to use them.On the downside, the sides are not removable, and the load capacity is pretty low. The flatbed garden cart type does not have any sides whatsoever. It is great for bulky, awkward sized and non-standard load, and long gardening tools, but it is no good for anything that is already not in a bag or a kind of container. The way they function mostly resembles the wagon type as they are also pulled with a handle. This type can best be described as rolling storage space which doubles as a comfortable gardening seat. It is also pulled with a strap or a handle for easy transportation around the yard. Yet, it is distinguished by the cover that can be used as a seat or, in most cases, as a kneeling pad. For this reason, it is perfect for older people who do the gardening as a hobby. It is not, however, convenient for the bulky and massive load as its capacity is usually less than that of the other types of garden carts. Never buy the cheapest garden cart, it is a piece of equipment that can last you a lifetime if you choose wisely. Make sure not to leave your cart out in the open and rather store them somewhere to be protected from the weather conditions. If you do not have such a space, at least cover it to help prevent rust and other problems. Grease the squeaky wheels right away. Plastic wheels are light weighted but not suitable for all kinds of terrains and heavy load. Rubber or pneumatic tires are better for rougher terrain and heavier load. The thicker the wheels, the smoother the cart will go over all terrains, but the bigger wheels are also harder to maneuver. If gardening is a hobby, or you take care of the garden around your house, you can settle with a weight capacity of up to 600 pounds (usually, 200 pounds is more than enough). 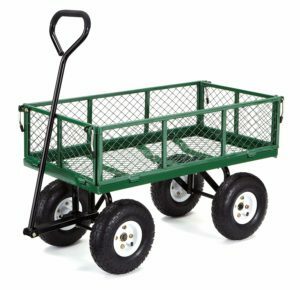 However, for those who need more, there are garden carts with a weight capacity of up to 1200 lbs. Also, you need to consider the shape of the load you are likely to carry, if it is bulky or unusually shaped, cause if so, you might want to consider a flatbed cart or a utility wagon. Polyethylene beds are scratch and dent resistant, and the weather does them no harm. Plastic beds are lighter and easier to pull. However, they are smaller and pose a risk of cracking over time. Learn more about bed construction on this page. 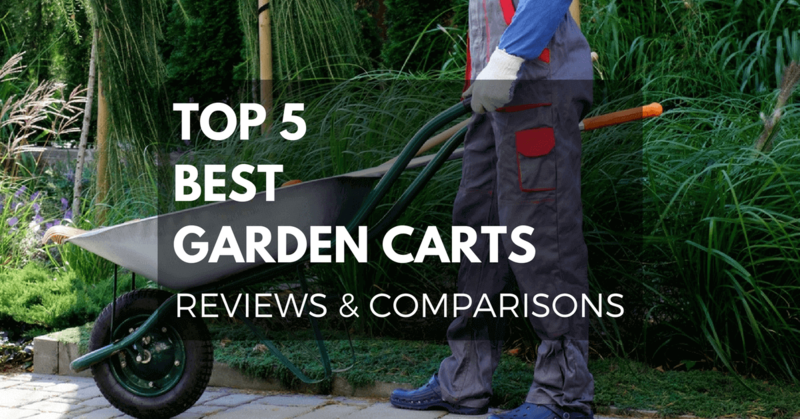 In the hope that you are now able to make an informed decision on what type of garden cart you need, and which features it should possess, we move on to our choice of five currently best garden carts on the market. Well, it is certainly a difficult choice to make as they are all different types and have entirely different features. All the carts reviewed are best at something, but as we must choose an overall winner, we vote for Gorilla Carts Steel Garden Cart. Although it is the most expensive choice, it is also the one that is sure to last the longest. Another great plus is that the cart is very versatile and can be used both by recreational gardeners and professionals. If you are looking for a less expensive option, you might consider Suncast GDS200D Garden Scooter, which is our favorite budget-friendly option. Be sure though, all the garden carts included in our review are bestsellers for a reason, do not hesitate to buy the one that best suits your needs.